Light micrograph of Monocercomonoides sp. (PA203). Credit: Dr Naoji Yubuki. Mitochondria are membrane-bound components within cells that are often described as the cells' powerhouses. They've long been considered as essential components for life in eukaryotes, the group including plants, fungi, animals, and unicellular protists, if for no other reason than that every known eukaryote had them. But researchers reporting in the Cell Press journal Current Biology on May 12, 2016 now challenge this notion. They've discovered a eukaryote that contains absolutely no trace of mitochondria at all. "In low-oxygen environments, eukaryotes often possess a reduced form of the mitochondrion, but it was believed that some of the mitochondrial functions are so essential that these organelles are indispensable for their life," says Anna Karnkowska, a former post-doctoral fellow at Charles University in Prague who is now at the University of British Columbia in Vancouver, Canada. "We have characterized a eukaryotic microbe which indeed possesses no mitochondrion at all." Organisms from the genus Monocercomonoides have been recognized for more than 80 years. They are related to the human pathogens Giardia and Trichomonas, all of which belong to a group known as Metamonada, which lives exclusively in low-oxygen environments. In the new study, Karnkowska and Vladimir Hampl at Charles University in Prague and BIOCEV, along with colleagues from the Czech Republic and Canada, sequenced the Monocercomonoides genome. They were surprised to find that this organism lacks all mitochondrial proteins. Monocercomonoides seems to have gotten by without mitochondria thanks to a cytosolic sulfur mobilization system (SUF) that they acquired from bacteria and that appears to substitute for essential mitochondrial functions. Through a unique combination of events including the loss of many mitochondrial functions and the acquisition of this essential machinery from prokaryotes, "this organism has evolved beyond the known limits that biologists circumscribed," Karnkowska says. Researchers have been looking for organisms lacking mitochondria for decades. As the years went by, it seemed more and more unlikely that a eukaryote that truly lacked mitochondria would ever be found. Nevertheless, Karnkowska, Hampl, and their colleagues now say there may be others. 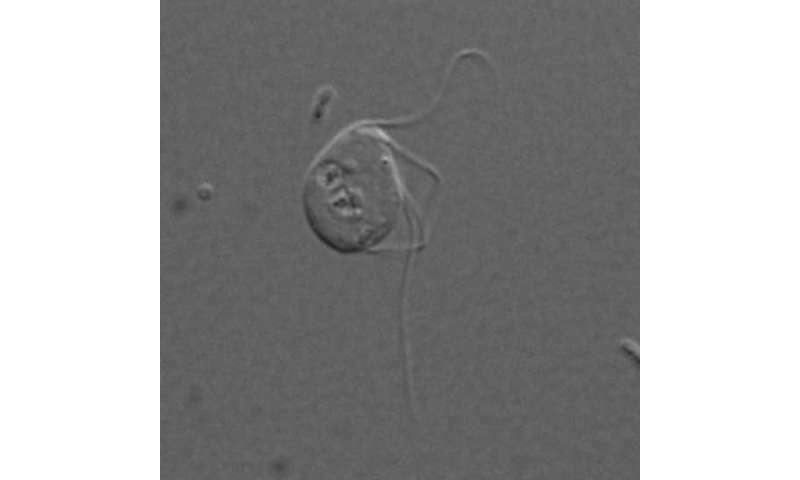 "This amazing organism is a striking example of a cell which refuses to adhere to the standard cell biology text book, and we believe there may be many more similar examples in the so far hidden diversity in the world of microbial eukaryotes—the protists," Karnkowska says. The researchers say they'd now like to learn more about how these organisms function. They'd also like to better characterize Monocercomonoides and its relatives to understand their discovery in a broader, evolutionary context. "It is very likely that the mitochondrion is absent in the whole group called oxymonads," senior author Vladimir Hampl says. "We would like to know how long ago the mitochondria were lost." Arrgh! For a moment there I thought it was a stem eukaryote from before the mitochondrion endosymbiosis. That would elucidate eukaryote evolution a lot. But it seems they can see that it has lost the mitochondrion... Still helpful, but not as much as a stem lineage. It kicks Lane's energy theory on eukaryotes onto the curb, at least. Don't it just! Too bad JVK isn't here to have his nose rubbed in it. Can't say I actually read most his garbage, but his twisted RNA theories (pun intended) seemed to rest on it. And a lot of bad logic. @torbjorn - A pre-mitochondrion-eukaryote was my first hope as well. It make sense that this lives in a low-oxygen environment - even our own cells can rely on non-mitochondrial glycolysis for short periods when oxygen is scarce. Low-oxygen microbes generally have slow metabolisms, and glycolysis provides much less energy but works without any added oxygen. It may be that mitochondria were fast-metabolism microbes that evolved once oxygen was plentiful in some environments, and that slow eukaryotes already also existed by that time in low-oxygen environments. Ecosystems would then evolve at the environment borders where fast mitochondria would break down waste products from eukaryortic glycolysis. If slow eukaryotes and proto-mitochondria were already cooperating for countless generations, eukaryotes housing mitochondria internally is not such a big step. This would then allow fast eukarytes to evolve and dominate the eukaryotic world. @chileastro: I haven't followed the pheromone troll that closely, but it is nice if this helps! Yes, all phylogenies seems to agree that the alphaproteobacteria that the mitochondrion descends from split ~2 Ga, after the atmosphere oxygenation. Your ecological hypothesis makes a lot of sense. The latest phylogeny on the pre-mitochondrion I know of claims it was an ATP parasite rather than donor as today - it had an ancestral ATP importer gene, the exporter gene is a a horizontal gene transfer from other bacteria. So it would indeed try to get close to its host that did the heavy metabolic lifting. Presumably the Thorarchaeon host (no longer Lokiarchaeon in the latest tree) phagocytosis 'ate' its parasites at times. When one evolved the ability to survive inside the cytosis vesicle, it was set to evolve from parasite to helpful symbiont, The combined organism generated more descendants that way. He's baaaaack! Or there's another pheromone patsy. The latest phylogeny on the pre-mitochondrion I know of claims it was an ATP parasite rather than donor as today - it had an ancestral ATP importer gene, the exporter gene is a a horizontal gene transfer from other bacteria. So it would indeed try to get close to its host that did the heavy metabolic lifting. Once it acquired the exporter gene, it and the primitive eukaryote could start a mutually beneficial exchange. They would then tend to evolve to tolerate and even sustain each other, and probably pass through a closely cooperative stage a bit like the micorrhizal exchange between plant roots and fungi today. That would provide plenty of opportunities for a gradual transition to being endosymbiont and eventually the tight association that allowed one eukaryote's descendants to be so successful that today we consider them a whole domain of life. All cells that derives from the LUCA can do that. In fact, the paper notes that the FeS protein cofactor production is "mostly dome by the mitochondria.ISC assembly system. The mitochondria allowed for gene segregation between the nucleus and the mitochondria, as was useful. The ATP production 'deal' is a basis for many hypotheses on mitochondria endosymbiosis, no least Lane's energy density hypothesis. I don't know what " higher thought" and "lower species" has to do with metabolism as such. The biological basis for 'thought' of any kind is a nervous system, and 'higher' thought has evolved in man unrelated lineages for reasons yet unknown. But if you are John Hewitt, you have a curious sympathy for creationist terminology and the religious non-biological 'ladder of descent', as we have been over before.